Okay for that last two weeks everyday at 10 am I have met with the same group of moms at the pool. We were all taking the kids to swim lessons. Priyasha is the youngest and loves the water. Being the youngest puts her at a disadvantage as she cannot reach the bottom of the pool at two and half feet. So she gets out of the pool and comes to me. I roll up my Capri's and walk with her in the water as far as I can without getting wet. I then hand her to her teacher and she is fine. I then stand on the edge of the pool and support her and even hold her hand. Well all the moms look at us and have this huge grin on their faces. They think it is cute, I think it looks silly. I look silly hanging over the pool in my clothes trying not to get wet. Everyday I say that I should bring my swim suite and everyday I do not. Well today was an exception. I thought if I got in a swim suite it would help her. 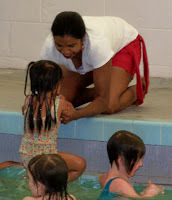 I joined the instructors and it was a hopeless idea.Priyasha got out of the pool and sat on the cement crying. She refused to get in the water with me. I stayed there and helped all the other kids out. I finally gave up and got dressed. 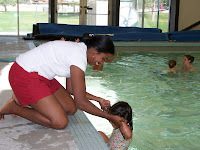 She then got in the water with the teacher was as happy as a clam. Go figure. Women they start young. Sending all these mixed signals of what they really want.